According to oral history, Ožĩja θiha ("Bear Paw") was a ferocious warrior, so much so that enemies of the Ĩyãħé Nakoda knew to avoid him. Those among his southern Ĩyãħé Nakoda group, the central and northern Ĩyãħé Nakoda groups, and also ally tribes respected him. Eventually, some of the older leaders within this southern group decided he was of a stronger character than their current Chief. Ožĩja θiha was not only fearless, but he was a man of integrity with a kind spirit. 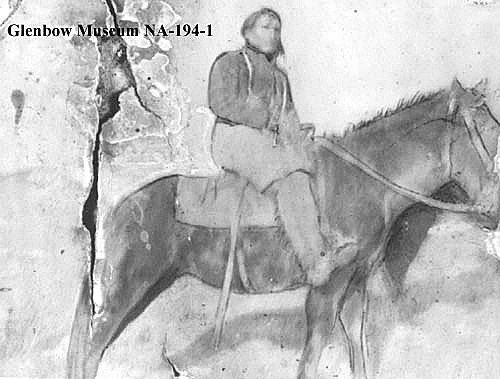 Ožĩja θiha represented his Ĩyãħé Nakoda group during the Treaty 7 peace negotiations with the government in 1877. It was said he would rather have battled and wiped out the traditional Blackfoot enemy that also attended these peace negotiations. On behalf of his group, Ožĩja θiha placed his mark on the document. Beside his mark was written "Mas-gwa-ah-sid (Cree meaning "Bear Paw"), or Bears Paw". Also signing Treaty 7, representing their respective Ĩyãħé Nakoda groups, were Chi-ne-ka (a Cree name) and Ki-chi-pwot (a Cree name). Written beside their three marks were the words: "Stony Chiefs". Since that time, the Ĩyãħé Nakoda group led by Ožĩja θiha was known as "Bearspaw Band". After Treaty 7 was signed, the Bearspaw Band was contained on the Morley Reserve together with the central and northern Ĩyãħé Nakoda groups. Ožĩja θiha was a strong advocate for the rights of his people until his death on the Morley Reserve in 1903.